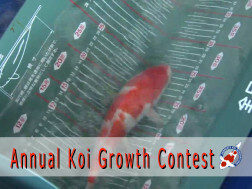 Andy’s famous Annual Koi Growth Contest is held at Andrew’s Koi every year on the first Saturday in the month of May. There is over 1500-selected one-year-old koi available for purchase at $100.00 each. The koi will vary in size from 5 inches – 12 inches. Everyone is invited to come learn and join the fun. The event is open to beginners, hobbyist and professionals. Come early to select your koi. A free lunch is available. Prizes and awards will be presented to the winners.